With just one visit to our providers you can be on the road to living a pain free life. If you suffer with the Following Foot / Ankle Conditions; learn more about how Regenerative Cell Therapy can help restore your health and help you live Pain-Free! 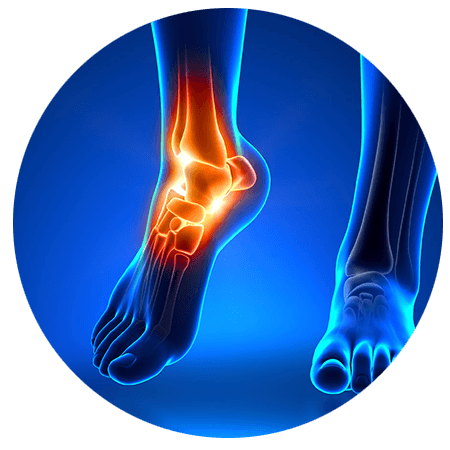 Front Range Regenerative Medicine’s providers have extensive experience when it comes to foot and ankle pain treatment. We have pioneered the industry’s latest proven alternatives to surgery and steroids. Our same-day procedures will alleviate your foot and ankle pain regardless of the cause. Our revolutionary platelet rich plasma (PRP) and regenerative cell procedures treat all the damages and underlying conditions that cause you pain. With just one visit to our specialists you can be on the road to living a pain free life. Our doctors utilize Regenerative Cell Therapy to rebuild and strengthen damaged tissue. We can start your healing process on the initial visit. Alleviate your foot and ankle pain today! Plantar fascia or arch tendon is located at the bottom of the foot. It is a broad connective tissue that runs across the bottom of the foot and spreads from the heel bone to the toes at the front of the foot. Its overuse is what causes plantar fasciitis. The common symptoms of planter fasciitis include pain upon walking; the pain decreases as the foot begins to get warm, and also stabbing heel pain which originate at the bottom of the heel. This condition is commonly identified as a heel spur although both are not entirely the same. This is because a heel spur arises at the point where the plantar fascia connects the heel bone (calcaneus) which develops as a bony growth. At Front Range Regenerative Medicine we have introduced a new regenerative technique for the treatment of plantar fasciitis. We treat the stressed connective tissue with an injection of regenerative cells. Our procedure regenerates damaged tissue while reducing pain. So if you are not satisfied with the results that traditional orthopedic treatments have delivered for your plantar fasciitis, contact us to learn more about how regenerative cell therapy can help. Since regenerative cell therapy is not derived from embryonic stem cells or fetal tissue, there are no ethical issues with the treatment. The regenerative cell therapy consists of an injection directly into the painful area. The therapy has the potential to actually alter the course of the condition and not simply mask the pain. This therapy has significant potential for those in pain, and could actually repair structural problems while treating pain and inflammation simultaneously. The regenerative cell therapy material is from your own body. It acts as an immunologically privileged material, meaning it has NOT been shown to cause any rejection reaction in the body. This means there is no graft versus host problem. If you’re suffering with Chronic Foot or Ankle pain, find out if you are a good candidate for Regenerative Cell Therapy. Schedule your free consultation with our specialists today! Front Range Regenerative Medicine offers regenerative therapy and non-invasive medical procedures for a wide range of medical conditions, including chronic pain and joint injury.